The Pahrump Valley Winery Tour is just for adults and offers FREE wine tasting from 10:30 AM to 5:00 PM (7days a week). Located about 50 miles west of Las Vegas, it takes just an hour from Strip to reach the quiet town of Pahrump. Since 2004, the Pahrump Valley Winery has received over 300 national wine awards. 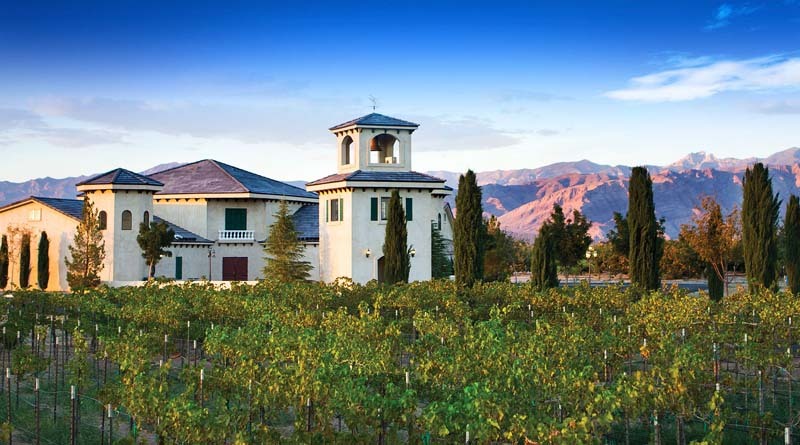 While on the Pahrump Valley Winery Tour, never miss tasting the award-winning wines. Besides wine tasting, here you can wander through the peaceful rose garden with its gazebo and Spring Mountains surroundings. You can dine at the Symphony’s; the upscale-casual restaurant which is the top rated in Pahrump by Tripadvisor. You can also purchase your favorite wine to gift your friends and relatives. The Pahrump Valley Winery Tour in our luxury limousines offers you door to door pickup and drop service. You can sit back and relax with your buddies while leaving the driving to us. The drive to Pahrump is very picturesque, and the level of attention and service you will receive at the winery is always fantastic. The Pahrump Valley Winery Tour from Las Vegas passes through beautiful Red Rock Canyon. A break at the Canyon can be arranged easily by paying the additional hourly charge (based on the vehicle you select). The biggest advantage of the Pahrump Valley Winery Tour is that you can indulge in the award-winning wines without worrying about driving back home/hotel. Whether you are an experienced connoisseur or a first-timer, our Pahrump Valley Wine Tour will create a memorable experience. The selection of limo depends on the number of passengers and your budget. We have a full range of vehicles including SUVs, sedans, stretch limousines, limo coaches and limo buses. Have a look at our entire fleet and make a selection.